Apparently, the whole brain is active during dreams, from the brain stem to the cortex. Most dreams occur during rapid eye movement (REM) sleep. I very rarely remember my dreams, so when I do, it’s a big deal. In a recent dream, I was at a social event (that may not surprise many people that I was socialising in my sleep!) and this event extended from the day into the evening. (Again, this won’t come as a shock that I ‘pushed on’ into the evening). During this dream, I seemed to be desperate to find a way to temporarily leave my friends to go to either my home or a hotel room so that I could do my medical treatment. This would include using equipment like my nebuliser and doing my physiotherapy to help clear my lungs of mucous, which clog up CF lungs. I would also have been looking to check my blood sugar levels because my diabetes has robbed me of spontaneity and I would have wanted to know my levels, especially as I was drinking alcohol at this party. For every twist and turn of this social event, I could feel the deep tension in me that I couldn’t just enjoy the festivities like all those around me at the party. To enjoy the duration of fun, I had to build into my early evening the opportunity to do my medication. After all, doing my treatments enables me to live my life. As well as this, I was coughing throughout the dream, as I do throughout every day when I’m awake. In the end, I never made it to a venue to do my much-required medication because my dream was brutally terminated by me having an actual real coughing fit that shook me out of my sleepy stupor. When you suffer and endure a condition like CF, you are never off the clock. Even when asleep and dreaming, I am that ‘ill person’ and I don’t get time off from CF and diabetes. I cannot even be healthy and not cough in my dreams! So ingrained in my subconscious is my daily regime and regular medical interventions that I know I have to be compliant whether I’m awake or not! I woke up with a rye smile that I’m never off the CF grid and bemused that even in my dreams, I cannot be healthy, spontaneous and care-free (and drink all day uninhibited). This is not a pity-party nor is it a sob-story. This is just my reality. I’d say that the majority of my healthy peers do (understandably) get peeved and frustrated when they have a short bout of illness, like a cold or flu. Just imagine how they would feel if they were always sick, even in dreams? In the UK, we endured a tough and prolonged winter. For me, this was punctuated by one of my punishing IV treatments for my cystic fibrosis (CF)* earlier in 2018. There was also an extensive recovery from a severe cold I succumbed to around Easter which was magnified by the adjustment to a longer work commute on the London Underground. So harsh were the impacts on my lungs from this cold, that my wife Katie had real concerns and felt it was the worst my cough had been in our 18 years together; and the Richter scale on that is pretty advanced. To suffer such a cold after battling through yet another IV felt very frustrating and deflating. Life is, as always, all about timing – bad and good. Fortunately, we enjoyed some early-Spring sunshine on a family holiday in Lanzarote where I was able to soak up the sun, which brought immediate benefits. Importantly, by walking to the local marina and using the hotel gym treadmill to keep exercising my lungs, it allowed me to stage my latest health Houdini act. All the time, I never wavered in telling Katie, family, friends and most importantly, myself, that I would overcome this tricky period to restore my previous levels of well-being (which is by the way a level that most healthy people would despise). I was drawing from my health well in order to feel well again. The reality is that I’ve been going to the well many thousands of times over my 47 years with these physical and mental health revivals. But it’s not always clear how much I’ve got left in the proverbial well. In my younger days the ‘water’ – the elixir of live – in my well was at the top and easy to draw from whenever I required, but over the years the well has been progressively depleted. During difficult and stressful times, I sometimes cannot see the water anymore in my deep well, but hope that there is enough left for me to draw upon. But improved health through my medical commitment, regular exercise and positivity gently restores my waters. What was invisible miraculously returns. This latest health comeback has been positively enriched by happy times such as my son Felix’s recent 11th birthday, attending fun sports events and it will hopefully be maintained through all the wonderful family and friends events that I’m looking forward to over the summer months. There are times, we can lack a proper understanding of and appreciation for something until it is no longer available to the standard we need and expect. The same rings true for the contents of our well. I know many healthy people who drew too much from their wells before realising that they’re physically or mentally spent. Indeed, when people ask you: ‘Are you well?’ they could equally be asking you: ‘How is your well?’? I don’t know how much is left in my well just as much as you (the readers) don’t know how much is left in your wells. All I can ever do is physically and mentally top up my well whenever I can – fix the roof while the sun is shining – so that I’m ready for any eventuality. Author’s tip: Look after your well to keep well. I honestly believe that there are very few people who live a charmed life, despite appearances to the contrary. We are all at some point faced with life challenges, such as the reality of losing a job, declining health, anxiety, depression and the ultimate leveller, death. This year has seen the usual rollercoaster of events across my illness cystic fibrosis (CF)*, my CF friends and community: from survival against all odds, to the miracle of lung transplants to chronic bouts of suffering and sadly to deaths. Only this week, I saw on Facebook that two 20 year old CF friends had died within days of each other. People who battle with a chronic physical or mental condition demonstrate that life is tough and can feel out of control. Underpinning everything is the harsh realisation that life is short, fragile but precious while it lasts. I recently discovered a wonderful poem by British Canadian poet Robert Service, written in the early 20th Century, ironically entitled ‘The Quitter’. I was won over by its battle-cry prose, and used the poem during the conclusion of my speech at the Wantage Literary Festival in honour of the famous poet John Betjeman, who is synonymous with the event. The poem does contain some old-fashioned language. For example, ‘It’s according to Hoyle’ relates to the 18th Century writer Edmond Hoyle to mean an ‘appeal to authority’. However, throughout its glorious prose, it poignantly explains that when life is tough, be determined to survive, don’t be a quitter! If ever there was a poem that depicts that daily mindset required to keep going against the tide, this is it. For many people, some life challenges can understandably feel overly arduous. Even getting through the next hour, day or week can seem too much to stomach when spirits are horribly low and hope has been vanquished. BUT, often the difference – as per the poem and based on my daily survival – is to have one more try. To get up and go again. I hope you like the poem – you’ll all need it one day! Wishing you all a happy Christmas and a healthy new year! I dedicate this blog to my CF warrior friends Oli Rayner and Helen Toghill, who inspire me to keep on battling! Fantastic video – please watch my good friend Mark Phillips as he did a tandem sky dive for CF! CF community – to see if CF patients and carers can be compensated to help scientists find a cure, please complete this short survey. Thanks! A life battling the chronic conditions of CF and diabetes is full of challenge, heartache, frustration and pain. However, defying these illnesses every day has brought me a tremendous perspective on life, what to appreciate and what to let go. It has also given me the golden opportunity of sharing my survival knowhow with others via all mediums. As well as this blog and my award-winning book ‘How have I cheated death?’, I am now an international public speaker at charities, government, pharmaceuticals and in the private sector. Thanks to my elder brother Chris for recommending me to the organisers. It is a real honour for me to be speaking at my first literary festival in the afternoon of 25 October in Wantage (near Oxford). Please click here to find out more about this renowned book festival and my speaking slot – if you are able to visit Wantage that day or can share with others, it would be lovely to have you there for what promises to be a special occasion. Not only is it my first book event, I will have my dear mum Margaret, my brother Chris, family and friends in the audience. There’s no chance of me making anything up this time! As of July this year, I have gone 21 months without a major intravenous (IV) treatment to combat my cystic fibrosis (CF)* and diabetes. It was unimaginable in my 20’s and 30’s that I could go for this duration without one of these horrid IV’s, especially when for most of my life I was habitually having them two times a year. This ‘good run of health’ is not a straight line however. Everyday requires two-three hours of medication and I’ve battled through two winters and a few debilitating colds. Because there’s no remission with my conditions, I stick to the mantra that ‘I’m only as healthy as my last treatment’ and I certainly never take my health for granted. Indeed, I’m constantly aware of the multitude of potential CF banana skins which could hasten deterioration in my health and necessitate an IV. I therefore quietly celebrate this enforced non-IV milestone. One huge ‘cause and effect’ with my health is the amount I can exercise and I have been jogging in the local park, going to the gym and playing some summer league veteran men’s hockey while recovering from a recent knee injury. While there is breath in my body, I will strive to keep my lungs active. As of 19 July, I will have been married to Katie for 14 years. We have been through a lot together (and reviewed our vows a few times!) but our relationship gets richer with each passing year. My CF memoir ‘How have I cheated death?’ continues to be well-received and each week I am sent positive feedback from around the world. My public speaking opportunities are also going well. I have been invited to speak and promote my book at the Wantage (not just) Betjeman Literary Festival on 25th October. Having never presented at a book festival, I am proud to be invited. 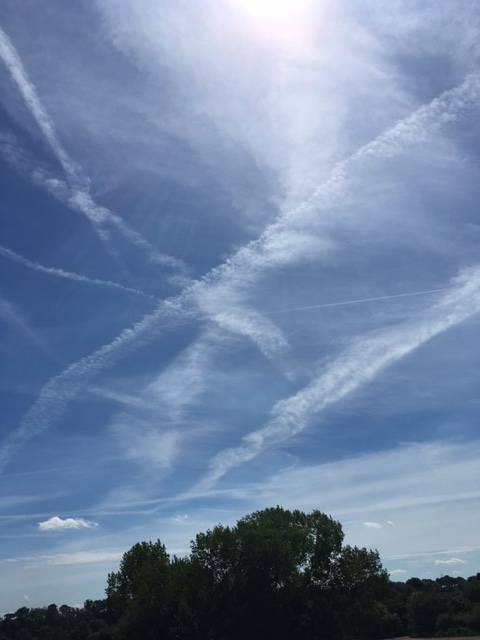 England in June and July has enjoyed some pleasant warm weather and I’ve been particularly struck by the stunning cloud formations in the sky (see photos). I take regular time out to watch the skies; be still, turn my brain to silent and feel present. 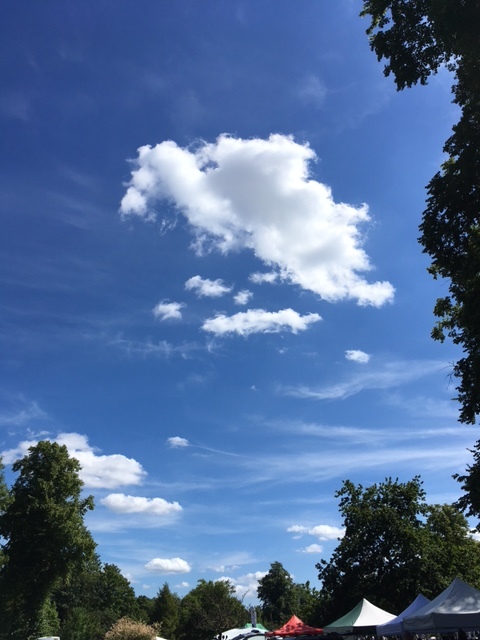 One favourite pastime with my son Felix is to lie down and observe the clouds together. These are special moments that cost nothing and the clouds are always there waiting for us – we just have to look up! I am always deeply touched when family and friends fundraise for CF and indirectly for me. On 22 July, my good friend Mark Phillips is doing a tandem sky dive for CF. The sky really will be his limit and I admire him for this brave act to raise money for my condition. Mark is close to hitting his fundraising target, so any kind donations to help him fly like a bird would be much appreciated here. People with CF are not meant to meet each other in person due to the risk of cross-infection but our bonds are amazingly strong as we understand the fight and resilience needed to endure what cannot yet be cured. One of my best English CF friends underwent a lung transplant on Friday and all seems to be going in the right direction for him, but it’s early. My thoughts are with him for his recovery to start a new life with healthy lungs. The film ‘Reach for the sky’ about Douglas Bader, played by Kenneth More, who lost both legs but led Hurricane squadrons in WW2 was one of my late Dad’s favourite films. Dad (also a Douglas) has been deceased for over four years but I know he’d take great pride in reading this blog and knowing I used this title. He’s forever in my heart and that of my mum and brothers.